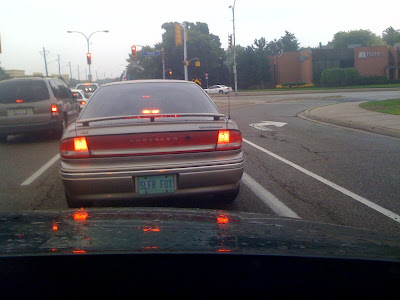 Reminds me of a friend I had who got one of the early vanity plates for Ontario. It said BARFT1. Everyone asked him why person got a licence plate that said barfed one. Person replied in annoyed manner its supposed to be barefoot! barefoot one, you know, for water skiing. Just a few years later, Ontario added seventh digit and the plate would've made sense! I am using my mothers' car right now with vanity plates and I hate it. I want my anonymous normal plates back and my boring old van. As the driver of the Intrepid might state, "Is that the catayltic converter I can smell, or is it just me...?" LO....I'm not telling because she loves them and would be upset if she happened to read this and found out how stupid I think they are.